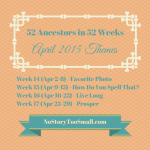 Posted in 52 Ancestors Challenge on October 24, 2015 by Amy Johnson Crow. 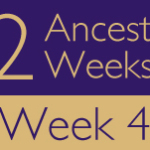 Someone asked me the other day if I’ll be doing “52 Ancestors in 52 Weeks” in 2016. I haven’t decided yet. There have been so many changes in my work, plus the challenges with family health issues, that I need to decide what I can devote my time to — and what I can do well. The optional weekly theme for Week 42 was “Proud.” Many of us have an ancestor that we are proud of — or that we’re proud of our efforts to find them! Who did you write about this week? Leave a comment with a link to your post. Also take a look at the entries from Week 41. There were definitely some “colorful” tales! A 3C1R is a person I can admire and respect for this commitment of service to his community. I’m proud to say I was able to take the road into Ferschweiler (Germany) last week and walked where my ancestors walked. P.S. Amy, please do not feel bad if you decide to not do the “52 Ancestors in 52 Weeks” in 2016. Be proud! Remember the people you’ve inspired to write the stories of their ancestors. We’ve learned discipline, improved our writing, started blogs, learned to cite sources, found new sources for our research, met new ancestors – in short we have become better genealogists! Thank you. I wrote about finding more information about my Great Aunt Lorena Rice who died young. Between Amy’s tips in 31 Days to Better Genealogy and reaching out to people in the state she lived in, I have learned so much more about her, and even have a photo now. I am proud of my mother’s first cousin Paul Andrew who was an accomplished artist who studied with at least one of the renowned Group of Seven. This relative of my husband probably belonged more in last wee’s category of “colorful”, but I am following a pattern of tracing relatives, and he just insisted on being written about after his non-colorful sister last week. Adam LIMBACH, Jr. is my husband’s 2nd great uncle. Loved Women. Married Five. I’ve been working on writing about my 3rd great-grandparents, so this week it’s a 3rd great-grandmother I don’t know that much about, though I know she was born in Guysborough County, Nova Scotia and died in NYC. I wrote about Edward Buck, my 2nd Great Grandmother’s brother, because he was proud of his family’s status which I have not been able to verify yet! I have a partial list of names that I’m researching on my Ancestry profile page, search for pattidi123 in the member directory to see it. I’m cheating and posting this a week early. Amy, I know you have to decide how to best divide your time, but I do hope you’ll continue to do the series. I think a whole lot has been written, hundreds of articles that would never have been written otherwise – thanks to your encouragement and platform. Selfishly, I love to see what others have written and I’m much more likely to actually DO something if there is someone to be accountable to:) In either case, thank you. Sorry, the link got garbled above. 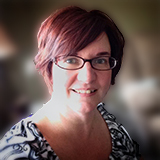 Amy, The amount of blogging that I’ve done has greatly increased because of your 52 Ancestors Challenge and for that, I am very grateful to you. I would love to see the series continue, but I understand that we all have many things going on in our lives. I wonder if there would be a way to transition the challenge to someone else or to share the management of the challenge. Thank you for inspiring me to write more. Pajm, you said what I was thinking. If there is a creative way to share the management of the challenge, it would certainly continue to be beneficial. But goodness, I know that Amy has a lot on her plate. so we shouldn’t expect her to keep doing this alone. Sorry about mangling your name, Pam. My great grandmother Karen Marie Nilsdatter and her husband were part of the wave of Norwegian immigrants to the United States in the 1800’s. Karen was an “ordinary” woman, not the recipient of any great honours or awards for heroism. She is someone of whom I’m proud for the strength and courage that she demonstrated in moving to a new land with new language and culture. I am proud of the discovery I made about a probable ancestor’s identity. Persistence does pay off in our research. This Family has been difficult but I am finally making progress. just this week made an on-line connection to another direct descendant of Edward, combined efforts may help. I wrote about an ancestor who was very hard to find. Consequently, I was proud when I did manage to find some records. I have a question. These 52 ancestors? Do they HAVE to be my direct ancestors or are siblings, cousins, aunts and uncles also allowed as well? Depending on the answer, I think I might do this for a challenge for 2016. Thank you. Just realized I never added week 42. Didn’t follow the theme yet again. Just chipping away at ancestors. I’m a week late as I was busybusybusy with a writers’ conference (another passion of mine). 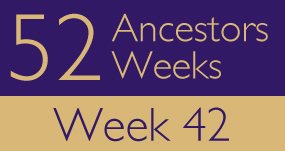 But here’s Week 42 – another ancestor in my ex-husband’s family line, for my children. POOLE, Priscilla – from KY to IL in the early 1800s. My 3rd great grandfather Thomas Johnson, a man who I wish I could go back in time and meet. I wrote about my 2nd great grandfather Thomas Duke Harrison of New Bern, NC. What happened to #43? I’m not sticking with the themes that much, so it doesn’t matter, but I’m easily confused and numerically challenged, so I hope I didn’t just miss #43 somewhere along the line. I wrote another post about my grandmother and the frightening experience of being taken to a Japanese prison camp. i wrote about Martin Luther’s father and my 12th great-grandfather. Amy, I know how busy life can get – seeing as I am about 3 weeks behind – so we’ll all understand if you don’t issue us a challenge list next year (though I would love another 52 weeks of themes). I didn’t take part in year 1, so I’m wondering if you had themes for 2014 or how it worked last year – perhaps I can do the 2014 challenge in 2016 for myself? I am about three weeks behind, but I have skipped over some of the September and October themes until I can figure out a fit for them. In the meantime, I have written about over 90 ancestors (including my husband’s family) in the nearly two years that we have been doing this. My plan for 2016 is 52 Ancestors Redux. It is time to visit many of the individuals that I already wrote about and update their stories. I may not do an ancestor a week, but I think it will be productive. There is so much new information. Maybe others would like to join me.